The distant shores of Torue Albes run red – a new overlord has emerged to lay siege to the free cities of the island kingdom. However, a band of heroes have rediscovered a legendary ship that may be the turning point in the battles to come. Raise the sails, batten down the hatches, and set sail for the Sea of Blood! The Sea of Blood features the return of the popular Advanced Campaign mode first introduced in the Road to Legend expansion. The Advanced Campaign allows a party of heroes to experience a series of adventures as one continuous story, culminating in an epic battle with the overlord himself. Sailing across the lands of Torue Albes, the heroes explore exotic islands, dig up buried treasures, and engage in fierce ship-to-ship battles with the forces of the overlord! 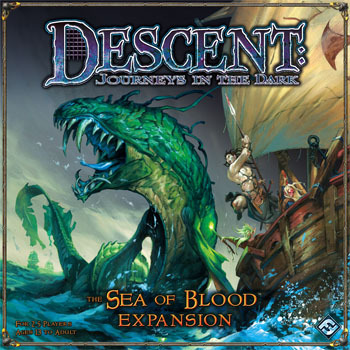 They’ll man the cannons, steer the ship, and swing across on the ropes to board enemy ships, while deadly Daggertooth Sharks circle in the waters below. The heroes keep the skills and items they acquire during each adventure, allowing them to face progressively harder challenges and deadlier foes. However, the heroes won’t be the only ones increasing in power – the overlord will also gain strength over time, coming ever closer to achieving his own nefarious goals!